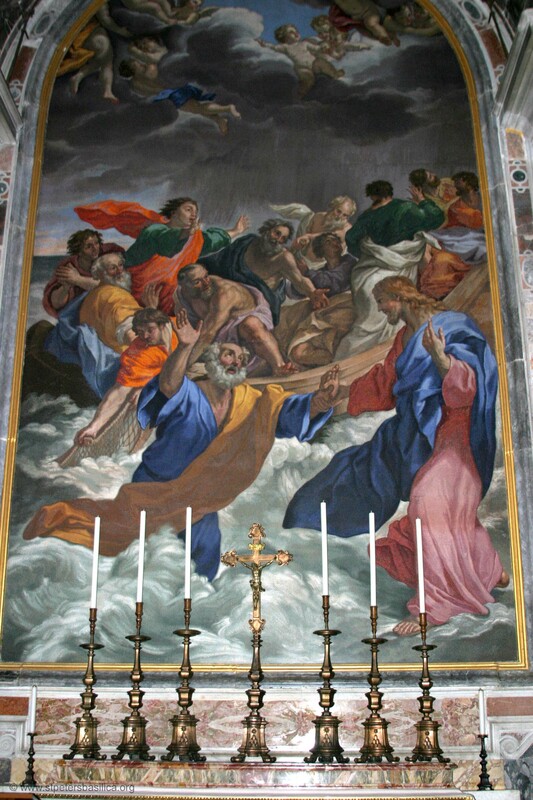 The Altar of the Navicella derives its name from the Gospel narrative of Jesus walking on the water. This mosaic was made in 1727 after a painting by Giovanni Lanfranco (1582-1647). Behind the St. Helen pier can be found the "Navicella" Altar, so called because of the mosaic of the altarpiece by Cristofari based on the pre-existent fresco by Lanfranco. It is a Baroque translation of Giotto's Navicella, but marred by the excessive emphasis of the facial expressions and postures, as well as a complicated composition. The two lateral columns should be noted. They are covered in Sienna yellow marble (the so-called "brocatello"); the only ones in St. Peter's, they replace the previous two in red granite, then in a poor state and later used for the thresholds of the five doors to the Basilica. 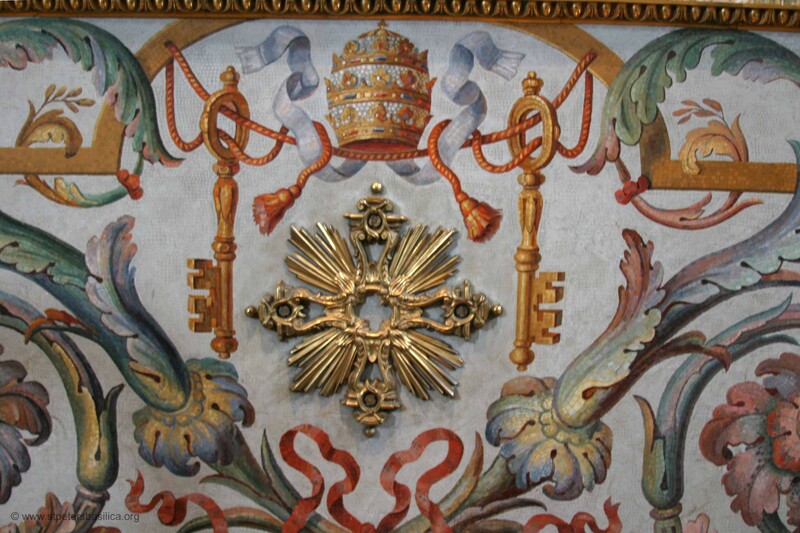 The altar of the Navicella was one of the altars in the navi piccole built and decorated during the pontificate of Clement VIII. Because Peter alone had faith enough to venture out onto the water, the story illustrates his special relationship with Christ and his primacy over the other apostles. Of course the episode can also be understood on a symbolic level. 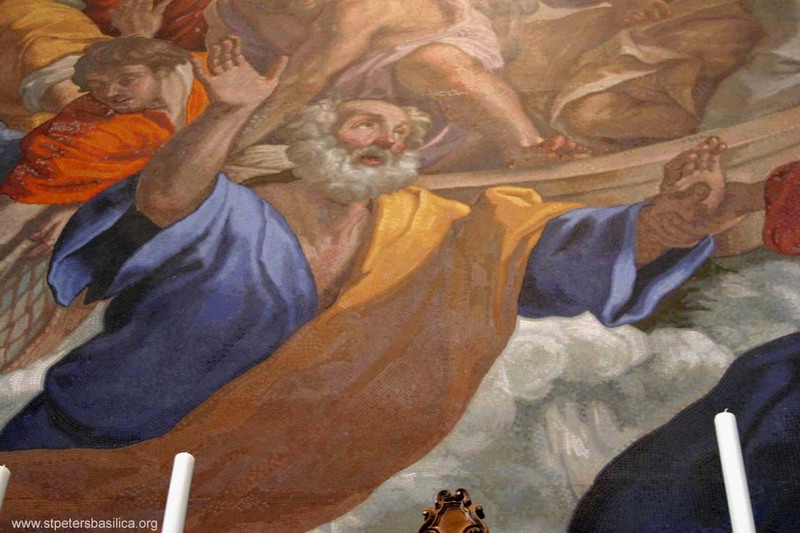 The wind and waves that threaten the boat are manifestations of sin and temptation. As Peter's faith falters, he sinks; but when he places his trust in God, he receives salvation. To understand why the story of Peter walking on the water was included in the Clementine cycle, one needs to be aware that the subject had long been associated with the basilica, through a famous and revered image by Giotto. When Clement VIII commissioned the altarpieces in the navi piccole, Giotto's Navicella was still outdoors and was showing signs of damage after three centuries of exposure to the elements. Bernardo Castello painted the original altarpiece between 1604 and 1605. Apparently the work was not well received. Castello's work has not survived. For Castello, an altarpiece in St. Peter's was the high point of his career. When in 1626 he learned of plans to replace his painting with another version of the same subject by a different artist, he became frantic. 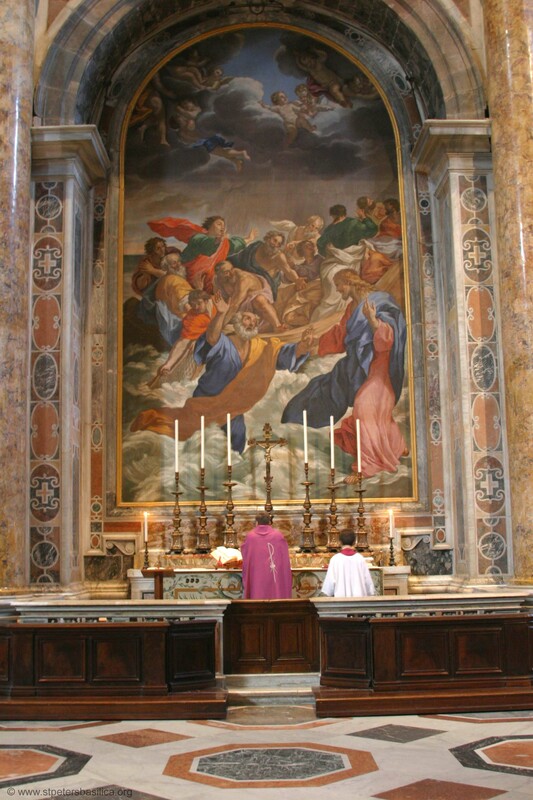 In August 1625, Giovanni Lanfranco petitioned the pope to paint the altarpiece in the New Sacristy. His request was denied, and instead Urban VIII assigned him the job of replacing Castello's altarpiece with another version of the same subject. Lanfranco began work on the altarpiece in 1627. In view of the deterioration of Castello's altarpiece and of the other five altarpieces painted on slate, Lanfranco opted for a different medium and painted in true fresco. 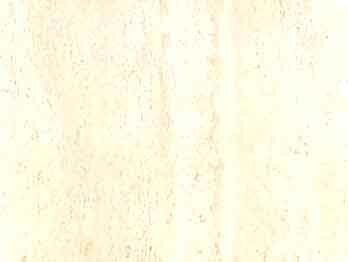 The work was completed by September 17, 1628. Despite the fact that it was painted in fresco, Lanfranco's Navicella soon showed signs of deterioration, and in 1640 the artist offered to return to Rome in order to "improve" it. The work was restored in 1662 by Raffaele Vanni and again between 1687 and 1694 by Giuseppe Montano. By 1721, it was detached from the wall in an operation that was only partially successful, as the upper portion of the composition was lost in the process, and transferred to the benediction loggia, where it hands today. 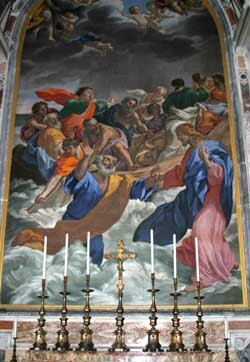 In 1726, a mosaic replica of Lanfranco's original painting, executed by Pietro Paolo Cristofari after a cartoon by Niccolo Ricciolini, was installed over the altar. 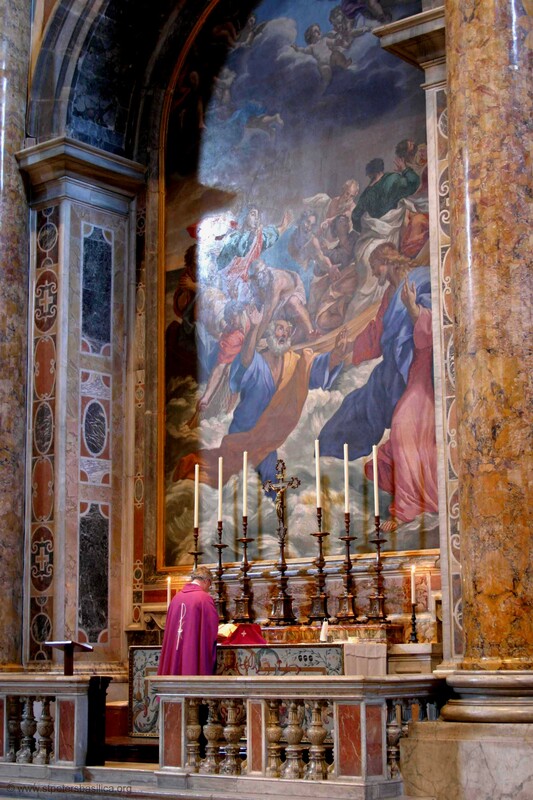 A year later, in 1727, Pope Benedict XIII dedicated the altar to God in honor of St Peter, placing inside it relics of Sts. Mansuetus and Honestus. The two side columns - unlike all the other columns in the Basilica - are not monolithic but have a travertine trunk covered with tesseras in broccatello marble.